This issue will focus on things you should know before purchasing a laser depending on laser characteristics. For example, when we purchase a car, we carefully check the horsepower, engine efficiency and the ride comfort compared to those of other cars. When we purchase a laser, we also need to check important features of a laser. Factors to be considered before purchasing a laser are categorized to 2 things in general for your understanding. The first question for determining the characteristic of a laser device is beam pattern. One easy way of describing it is to see if the beam pattern is even or not when the laser was irradiated on a color paper or tongue depressor. However, this method comes from a misunderstanding, and the beam pattern cannot be 100% sure with this method. This method is only useful when determining if the beam is circular or oval, or if the strength of the beam is biased to one side. More strictly, the handpiece should be removed when investigating a beam, because the beam pattern varies depending on the length once going through the condensing lens in the handpiece. Beam pattern (TEMmn) refers to the transverse mode representing the energy distribution on the plane perpendicular to the optical axis of the laser amplifier. TEM is an acronym for ‘Transverse Electromagnetic Mode’ and m and n means the degree of mode. For example, m=n=0 refers to single mode Gaussian distribution of bell-shaped energy distribution. m and n larger than 0 refers to multi-mode, in general, with energy distribution of mixed multiple single modes. This applies to most medical lasers. Transverse mode is sensitive to slight change in mirror alignment in the amplifier, resulting in great therapeutic impact. Transverse mode can be accurately observed only by using a beam profiler. However, thermal lasers, including CO2 laser, can be investigated about the burn pattern by using an easily obtainable acrylic panel. When delivering laser beam through an articulated arm, the laser beam uniformity cannot be determined without a beam profiler with CCD camera. It is not right to say a beam pattern is spatially uniform without using the above method, therefore. When delivering laser beam through an optical waveguide like optical fiber, very uniform beam can be obtained by the laser beams being mixed with each other while proceeding through the waveguide. 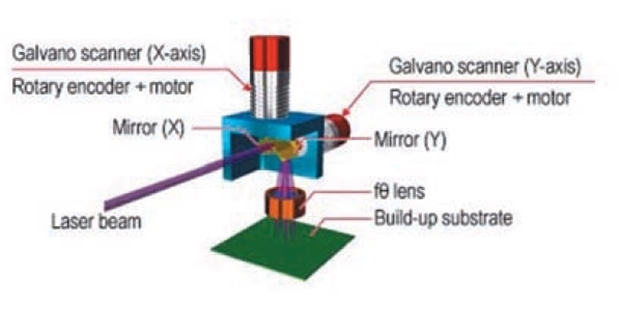 Therefore, free-running, long pulse, solid laser and diode laser, with low peak power (<1MW), can be delivered through optical fiber, resulting in very uniform beams. However, because the laser incident through the cross section of the optical fiber has high energy density, the cross section can be easily damaged by a dust particle. Therefore, when purchasing this type of laser, it is important to make sure that the laser is designed so that the area connecting optical fiber with the laser is well protected from dust or other different kind of materials. Ten years ago, a US-based company sold Q-switched Alexandrite laser in Korea. Most of the imported laser had some problem, which was caused by optical fiber damage. Lack of information on the damage threshold and improper design of the area where the optical fiber was connected with the laser were the reasons. Output stability is affected by several factors, including the output decreasing after continuous use of a solid laser for a long time due to insufficient capacity of the cooling system. In case of Q-switched Nd:YAG laser with wavelength conversion by a nonlinear crystal, stable 532nm output can be achieved only when the emitted beam always maintains stable polarization. When this is not compensated inside the resonator, the output will be decreased with time, which can be easily observed by operating a laser at high output with high repetition rates. Therefore, a laser should always maintain stable laser output (within 3-5% output variation rate) after long operation. Next is the stability of power supply, meaning the voltage should be constant at all times. Because a laser converts externally applied electricity or light energy to laser energy, change in externally applied energy means change in laser output. 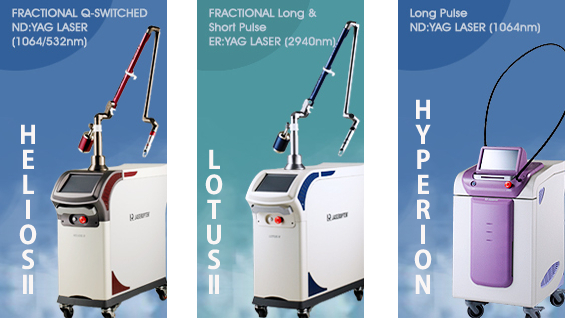 Power supply, usually placed inside the main body of the device, is not easily observable, but Q-switched Nd:YAG laser, for instance, can be checked for output energy by operating the device at the maximum energy setting with 4-5Hz. Energy meter should be used, in this case. The importance of safety can not be stressed enough in medical lasers. Electrical safety, which is inspected by the Ministry of Food and Drug Safety before approval, is out of question, but whether each company has measures for complete interruption for every number of cases that may occur while operating a laser should be closely checked. For example, when Galvano scanner, which is commonly used recently for fractional handpiece (Fig. 9-1), stops operating in the middle of a procedure, the condensed laser beam is irradiated continuously on one spot, inflicting irrevocable damage to the skin in case of CO2 laser. Galvano scanner, currently not produced in Korea, is entirely imported from overseas, and each manufacturer provides difference price range and performance. Recommended scanners are those made in the US or Germany because, as show in the figure below, motor is the most important part in a scanner, and the motor determines the possibility of whether laser beam could be irradiated to an accurate point or not. Next is F-Theta lens, which determines the size of a beam irradiated on the skin. Considering such an important role it plays, a satisfactory therapeutic effect cannot be expected from a product with low performance. This lens is also produced by optic companies in Korea, but being produced by special order, the price is much higher than those produced other countries. Besides the above mentioned Galvano scanner, there are other types of lasers currently not produced in Korea. Among them are Er:Glass fiber laser, also widely known as Fraxel laser, laser diode for hair removal and vascular lesions, and CO2 laser. Such dermatologic lasers are 100% imported from other countries. What matter is the company that produces them. For example, US-based Reliant (current Solta medical), which is famous for Fraxel, has exclusive supply of laser from US-based IPG Photonics, a manufacturer specializing in optical fiber lasers. There are only 2-3 manufacturers around the world specializing in Er:Glass fiber laser. Therefore, when purchasing a laser in Korea, it is imperative to check the country of origin and manufacturer, and select a company that merchandises lasers manufactured by a company with world renowned quality. Or else, there is no way of handling problems that may occur later in laser. This aspect is considered most important particularly in industrial lasers. Another important factor to be considered when purchasing a laser is to read the specification and see if the laser is operated in the same way, which is often neglected by many people. Industrial lasers are examined upon delivery and returned en bloc if the device is operated differently from the specification. Hospitals should also adopt this system. In conclusion, laser is an expensive equipment, which should be operated without much problem for at least 5 years after purchase. You will not regret the purchase if you only consider the above factors well before purchase.